Prime Minister Angus McBlair's government was almost defiant about celebrating the end of the 2nd Millennium on December 31st, 1999. He saw nothing wrong with reducing the 20th Century to 99 years. There were protests, of course. 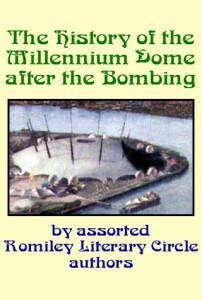 The Millennium Dome Saboteurs became the main focus of opposition. But it was the mysterious Millennium Dome Bomber who actually did something about McBlair's wilful refusal to do the right thing. The damage to the Dome was put right but the original Millennium Change celebrations had to be postponed. The government began to explore backdoor deals to sell the Dome as those responsible for its erection and its running were exposed to increasingly detailed scrutiny. Opening day came and went, and the government's embarrassment continued until the prime minister and his cronies were able to announce that the Dome had been sold. But was that the end of Prime Minister McBlair's troubles? Not by a long chalk!